Around the Thanksgiving holiday time, it’s always the most chaotic time of the year. I have Chris’ birthday around that time, as well as my nephew and niece all a day or two apart from each other. This year for Chris’ birthday, we took a trip to Napa to celebrate. Then after the trip I had to prep for Thanksgiving. Last year we were in Mexico. We also moved into our new house so we didn’t really have our Thanksgiving dinner in our new home until this year. Having said all that, my blog took a backseat. Anyway, I hope everyone had a lovely Thanksgiving. I know we did. Our bellies were full! Hello friends! Chris and I got back from our road trip Wednesday night. It has been so busy and chaotic that I haven’t been able to post until today. I’m playing catch-up now so apologies if you haven’t heard from me. I can’t believe we’re in mid November already! Wasn’t Halloween not too long ago?! 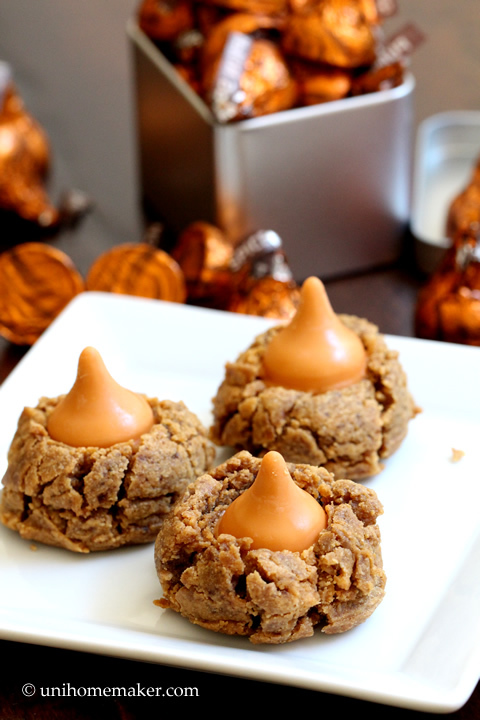 I feel like I didn’t get a chance to do as much pumpkin related recipes as I’d like this year. Happy Wednesday friends! I wanted to squeeze a few more pumpkin recipes in before the season ends so here’s another one. I’m not sure if the markets are still carrying pumpkin cream cheese. If they are, you should definitely buy a package and make this. I’m not big on cheesecake in general because they’re huge and so rich (I’m thinking Cheesecake Factory here…). I’m a firm believer in everything in moderation. 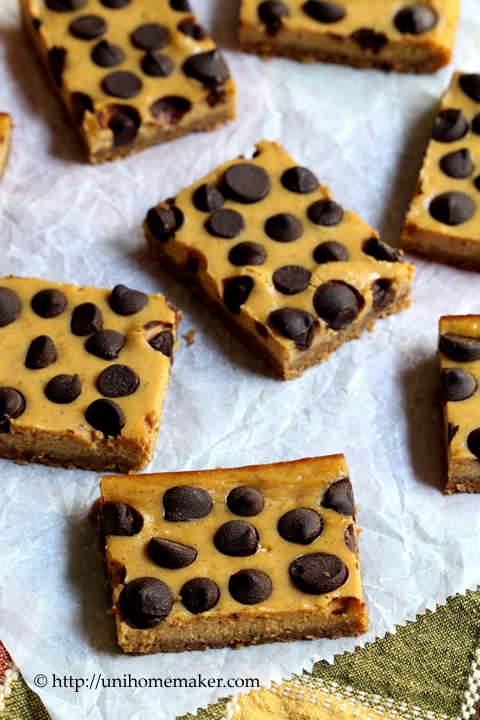 But cheesecake bars, I love. They’re smaller and for me, it’s plenty to remedy any sweet cravings you may be having. Remember my pumpkin chili? Well I took the leftovers and made it into a baked pasta dish. I love chili and all but having the same thing meal after meal can get boring and monotonous. This is before I learned about freezing chili. I’ll have to try that the next time I make a big pot. 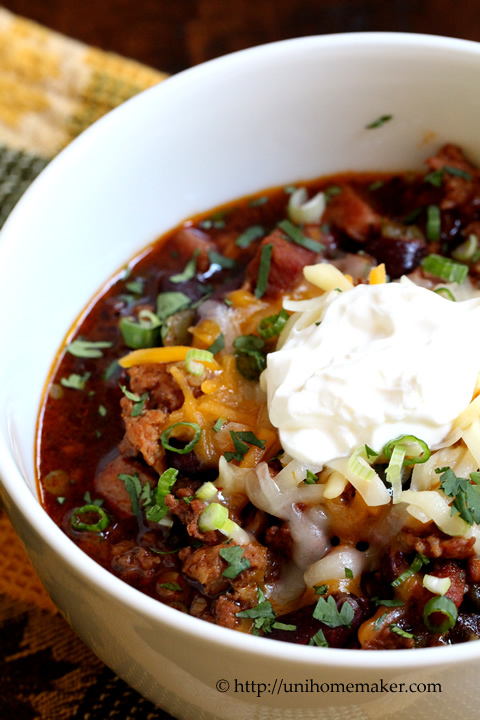 You can make this with any chili recipe, even canned ones. A few weeks ago, Chris and I splurged and bought ourselves a one-touch espresso machine. We’ve had our Starbucks Barista machine for over 10 years and thought it was time to retire it. It was a great machine but it was manual and cumbersome. Technology has come a long way. Now you can make a great espresso drink with a touch of a button! What used to be a 20-minute process to make a latte now only takes a couple minutes! Hi everyone! Sorry for the lack of posts. I’ve been battling a head cold and have been slow on writing my posts and comments. I hope everyone had a great weekend! Chris and I had a busy one. We went up to Healdsburg Saturday to pick-up our wine shipment and had lunch. It was an all day affair. The drive took longer than both activities combined. Then on Sunday, we hosted brunch at our place. It was a busy weekend and on Sunday evening, I started feeling some sinus congestion and fatigue. I’ve been catching Z’s here and there on the couch and every time I awoke, I felt even more tired and my head felt foggy and dizzy. It was not a good feeling. I baked these blondies today for my new neighbors. Since this is our first holiday in the new house, I wanted to do something nice for them. I wanted to bake something with a festive ingredient and also something that was easy to package. 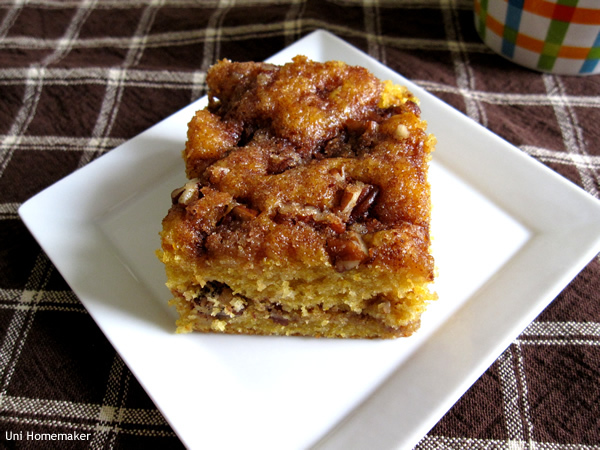 Chris and I sampled these blondies and were delighted to discover that they tasted like a pumpkin pie with eggnog. 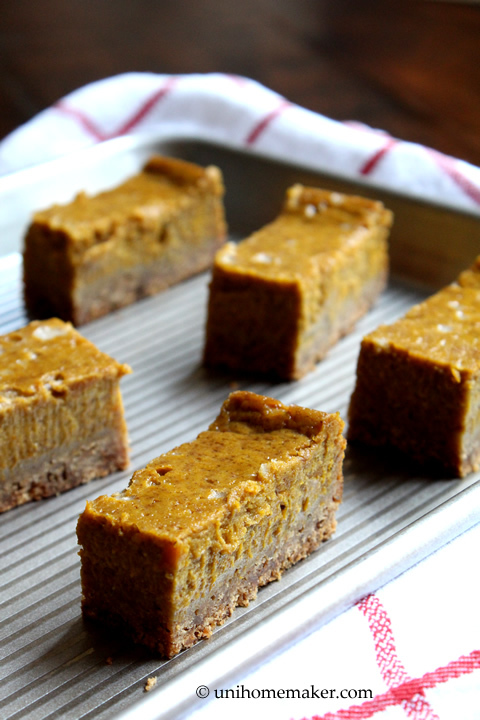 So if you dig pumpkin pie, bake a batch of these blondies today! Chris is a big fan of pumpkin. And every year, I bake a pumpkin pie around the fall time. This year, I thought I change things up and bake him a coffee cake instead. He loved it so much; he’s not willing to share it. 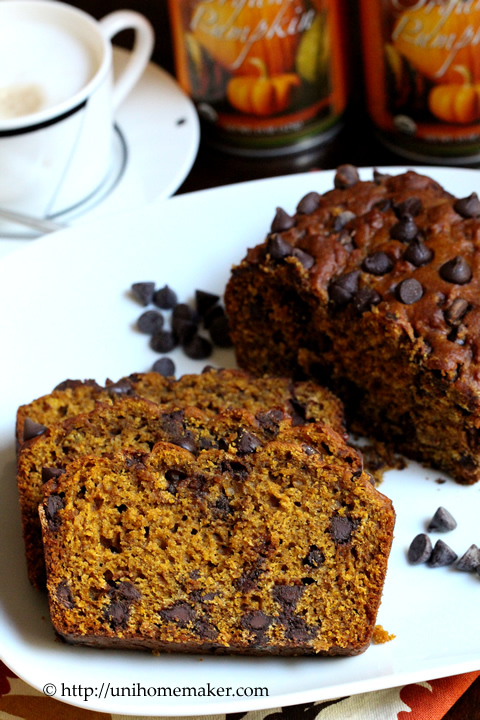 If you’re a big pumpkin fan, this is a good recipe to try.